APRIL 20, 2010  Hell Bent For Victory, a new 68-minute film directed by Michael D. Gough, follows the Troopers Drum & Bugle Corps throughout its memorable 2009 season and provides a solid keepsake for drum corps fans. 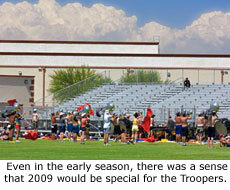 Don't worry that you already know how the Troopers' 2009 season ends. (The corps successfully reclaimed a spot among Drum Corps International's elite "Top 12" after a 23-year absence.) Hell Bent For Victory is a film where knowing how it ends isn't a spoiler, because ultimately, the film's message is that success is a journey, not a destination. This film will prove to be both timely and timeless. It's timely, because the new drum corps season has not yet begun, and the film forms a nice bridge for starving fans who need a dose of drum corps. The film is loaded with musical clips, drum beats and performance highlights, and it lets fans re-live one of the defining stories from last season. The film is timeless, because it draws attention to the universal benefits of the drum corps experience. Throughout the film, alumni recount how their time in drum corps helped propel them to success later in life. Historical footage pays tribute to the Troopers organization and founder Jim Jones, and reminds us of the decades-long respect fans have held for "America's Corps." The journey shown in the film is a complete season. Gough and sound engineer Dieter Wiselogel spent about eight weeks with the Troopers, covering the May move-ins, June rehearsals, July tour dates and August DCI World Championships. The film's excitement level goes up a notch during segments where scores are being announced after shows. The corps members know that in order to earn a spot at finals, they will need to be ranked ahead of corps that the Troopers have not outscored for many years. Throughout the season, the contests are consistently close. Sometimes the Troopers are ahead, sometimes they are not. The close competition added excitement for the film crew as well. Gough knew the Troopers were having a strong winter season, but he took a chance on starting the project and not knowing whether the corps would be a finalist. "The corps only made it into finals by 0.3 over the Colts. It was so close that it almost didn't happen," Gough said. Yet it's clear that from the beginning, the members and staff had a sense that 2009 was destined to be a special year for the Troopers. Comments captured in early season footage seem almost prophetic, such as when program coordinator and brass arranger Dean Westman told the corps members in June that they are "good enough to be at finals." Some of the film's best moments are provided by Westman, who consistently comes across as a brilliant educator. Westman's focus is not only on teaching students how to perform, but on how to know what is important in life. His speech about the love of the drum corps activity transcends the task at hand and causes the corps members to realize the long-term value of their summer marching in a drum corps. It seems remarkable that a film covering an entire summer of activity could be edited, mastered and packaged in only nine months. Gough credits the speed of delivery to his team's edit-as-you-go approach. "After shows, we would import tapes as we drove to the next state and literally edit the scenes together at night," Gough said. "Having the editing finished daily allowed us to see what we needed. It also put us in a position to let the movie sit for a while, and then come back with fresh eyes. Two weeks after finals, the first cut of the movie was finished. Then we tweaked it for seven months." With the bulk of the movie completed, Gough was able to work on promotional materials including trailers and a website. He has been steadily building a fan base through Facebook and through his many drum corps contacts. Michael Gough is no stranger to drum corps. He marched five seasons with the Troopers, during a period where the corps struggled competitively and financially. "Even though we weren't at the top of the charts, the pride of being a Trooper was enough to make me push and dream of a day when they would return to the Top 12," Gough said. "In 2003 I became the 19th drum major of the corps. I aged out in 2004 as the DM, and it was by far the most amazing experience of my life. I fell in love with the history of the Troopers. They were the first marching organization to do so many things. First to have souvies, first to go on tour, first to put curved formations on the field, first to have females in the hornline and win a championship. In the '60s and '70s they were the corps to beat!" Gough is also no stranger to filmmaking. "I picked up my first camera when I was nine years old. I made movies all through high school utilizing friends from the drama classes." Gough gained experience  and a regional Emmy award nomination  while working for Idaho Public Television. He completed his first feature film in 2005 and then expanded his knowledge by working on projects for other filmmakers. His credits include working for director Hilla Medalia on After The Storm, a documentary about rebuilding the arts in New Orleans after Hurricane Katrina. 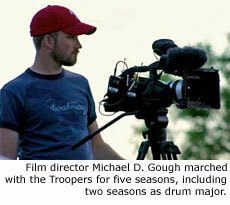 In 2007 Gough had the chance to blend his love of drum corps with his talent of filmmaking. He led the group that created America's Core, a film which followed the Troopers as they returned to the field after taking a year off to rebuild the organization. "America's Core told the story of a drum corps coming back stronger against all odds. It was my first documentary, and it was named '1st Runner Up for Best Documentary' at the 2008 Idaho International Film Festival." In early 2009 Gough came across a recording of the Troopers from a winter camp, and he knew it was time to create another film. "The recording was enough for me to believe that the Troopers had a real shot at finals. It was the moment I had been waiting for, for nearly a decade." "I hope this movie portrays the marching activity in a modern and fresh light, and sheds the image of the 'geeky' marching band," Gough said. "Marching is a sport! It is athletic! There is serious talent involved here. With the success of TV shows like Glee, it could be time for a mainstream TV or movie representation of marching band." 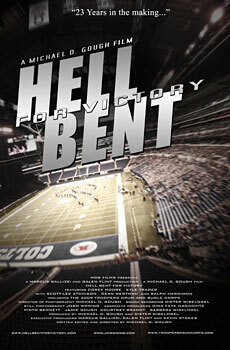 Hell Bent For Victory will officially be released on May 15, 2010. DVDs are currently available for pre-order for $20 plus shipping. Orders placed by April 22 will receive priority handling and will be shipped on May 10 to ensure receipt by May 15. To celebrate the film's release, a premier screening will be held May 15 at the Parkway Plaza Hotel in Casper, Wyoming. The free event is hosted by the Troopers and complimentary food is being provided by the Parkway Plaza Hotel and Convention Center. All alumni and fans are invited to view the film, meet the directors, and hear updates from the corps staff about the Troopers' progress for 2010. In addition, the film will be broadcast on Wyoming PBS beginning at 7:00 PM (Mountain) on May 13. The DVD will also be available at the Troopers' souvenir wagon wherever the corps performs during this summer's DCI tour. For more information or to place an order, visit HellBentForVictory.com. 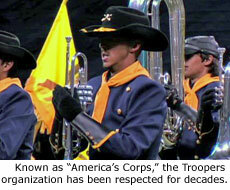 For information about the Troopers, visit TroopersDrumCorps.org. Images courtesy of MDG Films.